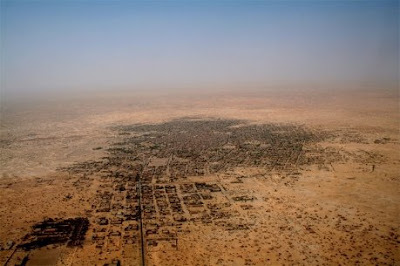 "If things keep going like they’re going, before long Timbuktu is going to be a “deserted” city in more ways than one: desertification, in which sand dunes swallow greener land, is a problem in several countries on the southern fringe of the Sahara. One of the cities most threatened is Timbuktu in Mali, a 1,000-year-old settlement that was a major center of Islamic learning during the 15th and 16th centuries. Several projects are under way to try to 're-green' the land with tree plantings and the like, but some parts of the city are already half buried in sand." might be best for Flint. cover it up, start over. Mother Earth might approve for once what happens there. I think it's the cover it up and start all over mentality that has caused problems with Flint's (lack of) urban planning in the first place. If you work within constraints, that's when the most creative work appears... not with the blank slate. But no one has the money or the time, and so goes another building razed to be turned into a parking lot for the city of Flint. Bummer about Timbuktu by the way, I was just reading in NG magazine about the Green Sahara... a good read. had nothing to do with generous motors? the town's been bleeding to death slowly since gm pulled out. what kind of urban planning will fix it? curious. a good start would sending a 206$ check to ACORN for one. Oh yeah, that GM thing ;)... but my point remains the same. If you don't have money, you can't fix up what's already there... that's what I heard about St. Matthew's school... it needed a new furnace and a new roof... no money, and so it goes. It's cheaper to bulldoze and make a parking lot. Isn't that what everyone always complains about Flint... that there's no parking? I'm still trying to figure that out... still I haven't parked there in 30 years, so what do I know... :) It's frustrating to say the least. constraints and creativity grows. makes me think a bit, and somewhat disagree with Your point Grumkin. would you put blinders on Picasso, or whomever? I see Your point, in as much as civic architecture, planning is concerned, but I think constraints and planning pretty much go by the wayside when money starts talking. I've seen designated critical dunes in Michigan get bulldozed, all for the sake of some McMansions and golf courses. Protected species obliterated, and other fauna pushed to the brink. The 'greening' of old urban areas is the new trend, correct? won't they grow better with a good foundation of soil or sand? far-fetched I know, but I've watched over my lifetime the disappearance of so many wetlands, wild places, etc. that when Mother Earth starts taking it back, I kinda wanna cheer. And this is how true Progress is made, the exchange of ideas. This is what will save our species. maybe. Okay, but bulldozing nature and bulldozing buildings are two different arguments. We all know the mcmansion issue all too well. People moved from the city for suburb space... their own plot that had more privacy than before. McMansions are an extension of that... bigger is better. It's not, but try telling that to someone who likes all you can eat buffets? Flint housing is bottomed out and they are still building new developments on Grand Blanc farms. I think I understand your first comment a bit better now. And I agree that when mother earth takes back the land it is a good thing. It happened in the NYC, and volunteer advocates tended these abandoned lots, landscaped parks, and now there is more greenspace than before. The difference is that these parks were between buildings... small spaces. So ultimately, the history of the space was preserved while adding something new at the same time. I always think of the Law Quad in Ann Arbor when I'm thinking of contraints. They needed to add to the existing law library awhile back, but in the original endowment for the Law Quad it was proposed that no additions could be added unless they were in the same style (ie. very expensive stone work). So they built the extension underground, and I think architecturally it was very creative... it lets in alot of natural light and it doesn't take away from the original structure. Better than putting up some crappy structure next door. Whats the difference? Timbuktu is being covered with sand, Flint is succumbing to brush, ghetto palm (look it up), and litter.